We got glitzy Fifa World Cup South Africa 2010 theme for Windows 7 users. 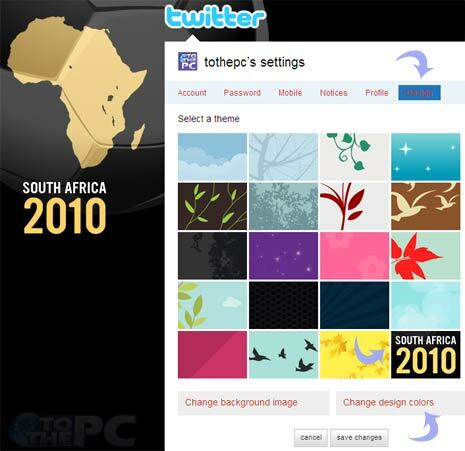 Now even Twitter users can get into Football World Cup fever with official “South Africa 2010” Twitter theme background. It is a dark and simple theme background featuring the South Africa map in front of glossy football design. 2. Then goto Settings and click on ‘Design’ tab. 3. Click “South Africa 2010” option under “Select a theme” (it should be last option). Your Twitter profile background should have dark yet stylish South Africa 2010 theme look. You can also change other colors matching this new background by clicking “change design colors’ at the bottom. Alternatively, you can also design & create custom Twitter backgrounds for more personalization.